With all the pressures of Ofsted and pupil outcomes, school furniture may not be top of your list of priorities, but making wise investment choices is important nonetheless. In the 21st century learning environment, we generally consider a school’s duty of care to be based on ICT and internet safety. However ensuring that students spend their time in schools sitting with a good posture, on chairs appropriately designed for their size is also an important aspect of a school’s duty of care. Children sitting comfortably are also more likely to be attentive and focused on learning. Therefore, buying furniture that will both help support learning and safeguard children’s health is important for all schools. However, with so many factors involved in the purchasing decision, including price and what size tables and chairs are suitable for which age group, making the right investment a challenge for many headteachers. 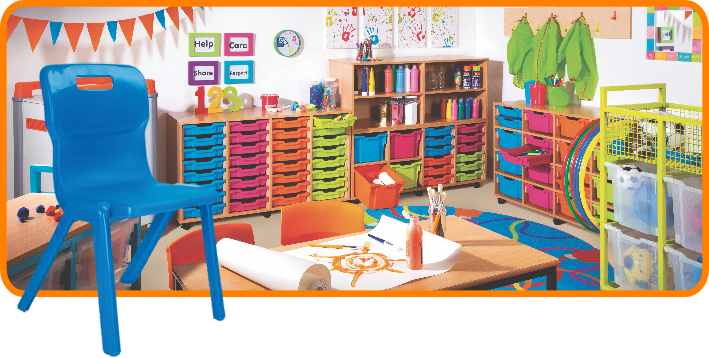 However, it is important that schools consider each of the following key areas, when purchasing classroom furniture. The wrong choice of chair could result in back pain. Remember that the height of a chair should relate to the height of a table. Quality manufacturers following British Standard guidelines will have calculated the ideal distance between the seat of the chair and the table to ensure maximum comfort and ergonomic benefits for the pupil. Research dating back to the 1990s suggests that most children’s furniture was based on the average size of children in the 1960s, when they tended to be shorter. The British Standard guidelines recommend that schools purchase furniture at the appropriate size for the age and dimension of the children using the equipment. There are six different sizes and these are listed in the list below. Size mark: 1. Age guide: 3-4. Foot colour code: Orange. Chair seat height: 260mm. Table height: 460mm. Size mark: 2. Age guide: 4-6. Foot colour code: Violet. Chair seat height: 310mm. Table height: 530mm. Size mark: 3. Age guide: 6-8. Foot colour code: Yellow. Chair seat height: 350mm. Table height: 590mm. Size mark: 4. Age guide: 8-11. Foot colour code: Red. Chair seat height: 380mm. Table height: 640mm. Size mark: 5. Age guide: 11-14. Foot colour code: Green. Chair seat height: 430mm. Table height: 710mm. Size mark: 6. Age guide: 14+. Foot colour code: Blue. Chair seat height: 460mm. Table height: 760mm. In general most products are designed for either indoor or outdoor use. Many outdoor furniture items will be floor fixed to prevent theft. However, some suppliers may offer free-standing equipment that can be ordered with the option of having casters fitted to support mobile use. Within the classroom, mobility is very important as class dynamics are constantly changing. Ideally educators should be able to adapt the environment and room layout as the children develop and learn, without having to call on maintenance personnel. To help this, furniture should be modular with the opportunity to be either mobile or stationary. Many schools have regular meetings to share observations of the children using the classroom environment and equipment. Generally furniture suppliers manufacture and supply directly from their head offices and work with their client schools. Many companies also distribute their product ranges through third party resellers. The manufacturer guarantees apply regardless of who supplies the products. Quality furniture suppliers will offer a range of after care services and warranties. For example, BESA’s furniture manufacturing members offer warranties and after care services covering from one to 25 years. A company that stands behind its equipment will offer a warranty and have a system in place to track all goods in the field, should a customer call with a query. After care services can include telephone and email support, on-site visits if necessary, product training, operation and maintenance - HOS education offers an unparrelled level of after care service to all schhol clients. Some of the budget furniture available on the high street might seem like good value for money at the outset and a cheaper option than some purpose-made school furniture, but it needs to be highly durable to stand up to classroom demands. In the current economic climate, whole life cycle costs are very important. Look at the supplier’s case studies and if it is a large investment, contact schools already using the equipment to find out what they think of the furniture. If the product has not been manufactured to cope with the stress and high-impact use in the classroom, its lifespan may be shorter than furniture purpose-made for classroom use and therefore prove more costly in the long run. A warranty is a good indicator of durability – many BESA members offer a 10-year guarantee, and company history is also an important quality by which to measure a supplier. It will be crucial for you to identify where and how the furniture will be used before making a purchasing decision. If your school is looking for furniture that can be used both indoors and outdoors, ensure your supplier is a specialist in this particular area. Materials such as moisture resistant MDF, architectural grade powder coat paintwork, and UV stable plastics are necessary for outdoor use. When planning your order, it is always best to consider how creative you can be in terms of using certain items as space dividers for work areas for staff or pupils. HOS offer a free consultation, advising best use of space and the appropriate products to meet your needs.